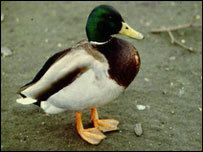 It may sound like a load of quackers but according to new research ducks have regional accents. "Cockney" ducks from London make a rougher sound, not unlike their human counterparts, so their fellow quackers can hear them above the city's hubbub. But their Cornish cousins communicate with a softer, more relaxed sound, the team from Middlesex University found. Ducks, like humans, are influenced by their environment, said Dr Victoria De Rijke, who has been nicknamed Dr Quack. Her research team discovered the difference after recording the quacks of ducks at two separate locations. The birds at Spitalfields City Farm in the heart of the cockney east London, were found to be "much louder and vocally excitable" than the ducks recorded on Trerieve Farm in Downderry, Cornwall, said English language lecturer Dr De Rijke. "The Cornish ducks made longer and more relaxed sounds, much more chilled out. "The cockney (London) quack is like a shout and a laugh, whereas the Cornish ducks sound more like they are giggling," she added. "London ducks have the stress of city life and a lot of noise to compete with, like sirens, horns, planes and trains." The Cornish ducks' open and quiet surroundings made all the difference to the way they quacked, she said. "So it is like humans; cockneys have short open vowels whereas the Cornish have longer vowels and speak fairly slowly," Dr De Rijke concluded. The study was designed to look at how language developed and Dr De Rijke now hopes to study the quacking sounds of Irish, Geordie and scouse ducks. Dr De Rijke said she chose ducks because they were sociable and had a good sense of humour like humans.